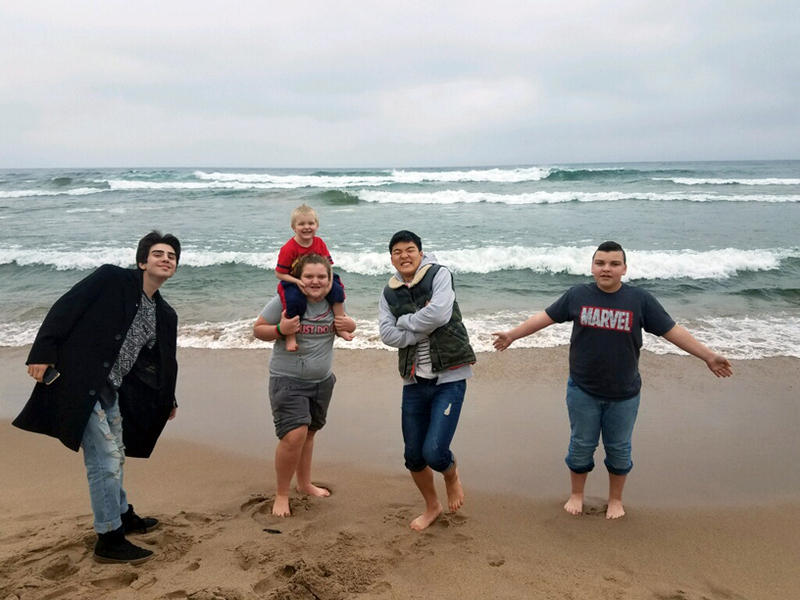 Photos provided by Rose Younggren Exchange: On the shore of Lake Superior with a few extra family members, (from left to right) Spark, Erin Younggren, Jack Younggren (on Erin’s shoulder), Sang and Tyler Younggren. According to host Rose Younggren, foreign-exchange students can only be identified in media by their given names. HOUGHTON — The Upper Peninsula is growing in popularity among international exchange students, offering a chance for both families and students to experience a new culture. “I always get the same comment: They never expected America to be like this,” said Rose Younggren. The students expect Hollywood when they first arrive, but by the time they head home, they aren’t disappointed at all, often having more fun than the students who did end up on the West Coast. Younggren and her family have been hosting students for years. She looks at it as an opportunity to experience the world without leaving home, while allowing their guests to experience American and U.P. cultures. The hardest part for Younggren is saying goodbye to these students who quickly become family. In the beginning, the students can be shy or struggle with regional slang language, but for Younggren, hosting exchange students is just like having another kid. They do chores, go to sports and get on the bus for school. With these students, it’s the little memories that stand out: seeing the black U.P. sky or the moon with students from big cities, or Lake Superior for those not from near a large body of water, or experiencing snow for the first time. In some cases, the closeness of family can be a cultural shock for some students. “They’ll call me up, and we’ll talk about those little moments. Some people think they can’t host because their life isn’t exciting enough, isn’t fun enough, (because) they don’t do anything. No. The idea of hosting is to show them what an everyday American family does,” Younggren said. When exchange students return, they bring these stories and recommend the area to others, leading to the U.P. gaining popularity among exchange students. Area students also participate and live in foreign countries but at a much lower number. “I think it’s almost putting your best foot forward when you’re showing people what America is about,” said Lauren Scherr, coordinator with International Cultural Exchange Services (ICES), one of the many organizations in the country. The beauty of the region and friendly locals make the Copper Country an ideal location. The students that come are vetted and typically are among the brightest students in their home countries. They ultimately even count toward funding for local schools. Locally, Lake Linden-Hubbell Public Schools received four students last year from Finland, Japan, Turkey and Bangladesh and are hoping for more this year. The district likes to encourage these students to talk with classrooms across the grade levels about their cultures and experiences, said Lake Linden-Hubbell Superintendent Craig Sundblad. The students aren’t just here for fun, he pointed out, they are in the United States as part of their education, whether it is language or culture. The 2018-19 school year is the first year some local residents will host exchange students. Jennifer Schaaf is looking forward to the new challenge following a spur-of-the-moment decision to host, something her parents did when she was a child. “It’s going to be new, something different,” she said. ICES is still looking for other homes to host students for this school year. Host homes are asked to supply a place to stay and meals while students are not in school.